Brief Summary: The core of the book is in the three paradoxes. A second chair leader is a “subordinate-leader.” They have a wide perspective (the organization as a whole), while also maintaining a deep perspective relative to their specific areas of leadership/expertise. They are content in the present, while often dreaming about the future. The book wasn’t a home run for me. I don’t disagree with any of it, but as an associate pastor, it did not fill me with lots of ah-ha’s or a clear vision for my role. But it is one of the few books available on this subject. Finished March, 2012. Chapter 2 – Am I a Second Chair Leader? 1. See issues through the eyes of the entire organization. 2. Be prepared to recognize and act on those unique moments that can shape you and set you apart as a second chair leader. Be willing to subordinate yourself to the first chair. Respect the lines of authority and autonomy given to you by the first chair. Word to the First Chair – Subordinate-Leader: Invest relational capital in your second chair(s); Allow for some leadership capacity. 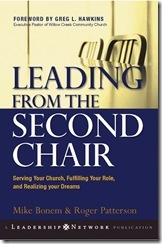 Effective second chair leaders are able to keep the entire organization in perspective (wide). Systems thinking can help. Keep eyes on the details of your own areas of responsibility (deep). Focus on building relational capital; Build a diversity of perspectives and styles into your team. Four Practices to make you deeper and wider. 1. Be a pulse taker (of the organization). 2. Be a vision amplifier. 3. Be a leader multiplier (esp. around the vision). 4. Be a gap filler. Word to the First Chairs on the Deep-Wide Paradox: To enable the width of your second chair, it helps to see him or her as a partner rather than a subordinate. Allow for behind the scenes debate and explanations. Reaching one’s ultimate goals may not mean going for the peak during this season. Remember to keep pursuing your dreams, even through seasons of waiting. Be careful with whom and how you share your dreams as a second chair. Cultivate “dream stewardship.” Delayed gratification is key. Dream with your first chair in your current setting AND hold to your own dreams. Be honest before beginning in the second chair, else your chair may be too big. When considering leaving, look for win-win situations, but it is often difficult to find. Beware of leaving too soon or hanging on too long. First chair leader changes often trigger second chair leader changes. Never do anything to undermine your organization. Use exits as an opportunity to grow and leave a better leader. Leave a legacy and don’t burn bridges. Start a shared vision with the second chair by being clear about your vision. Try to understand their vision and orientation. Listen for the discontentment in their ministries. Work to get to “our vision.” “Keep and release” second chairs – cultivate them until they are ready to move on.